I Love Traveling the Backroads! It may or may not be an advantage, but my job takes me on the road. When someone purchases a new ultrasound system from GE Heathcare I go to them and I teach them how to use their new system. I contract with GE so I sometimes go all over the country. However, this week my travels took me to Winston-Salem, NC. I love the traveling and when I can work it out, I allow extra travel time so that I can explore or actually take the back roads. I am always pulling out my Atlas and looking for the alternate route! Today, I finished early so I had time to stop off of 85N and explore Historic downtown Hillsborough, NC. Hillsborough is just west of Durham, NC. The interstate actually had signs that read "Historic Downtown Hillsborough". I have traveled 85 many times and always wanted to stop here. I found the cutest shop right off 85 on the main drag, "FETCH". The address is 116 S. Churton St, but it is the street that is the exit from 85. The window dressings and outside adornment just begged me to enter. The proprieter Karen was so inviting. She welcomed me and didn’t mind at all that I snapped some pictures of her lovely shop. 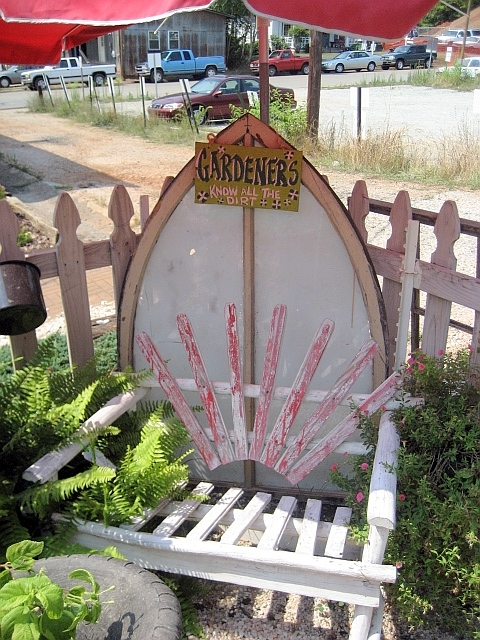 I LOVE these little historic downtown shops with the rear gardens! 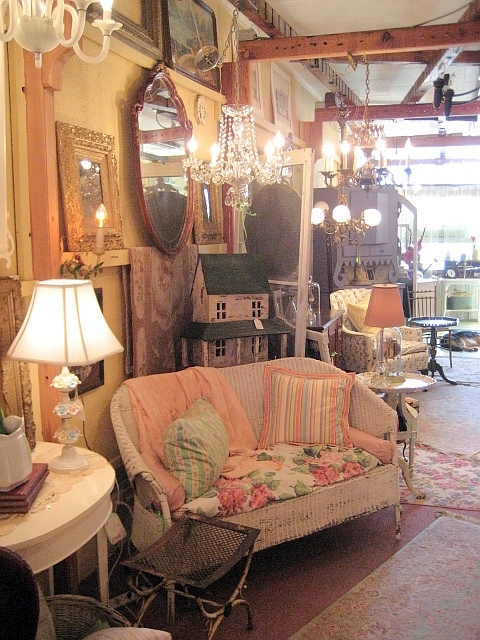 I can just see myself having a shop like this someday. The backyard garden will be chock full of herbs! Karen was so sweet and we had a very interesting exchange. If you are EVER in Hillsborough, NC you must stop by and visit this shop!! Can you see my reflection in the mirror!! 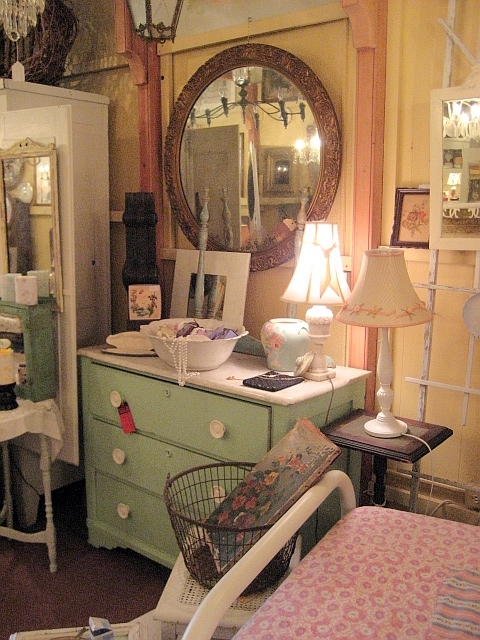 I could just take this whole dressing mirror/table home right now! OK, this was the tricky part! 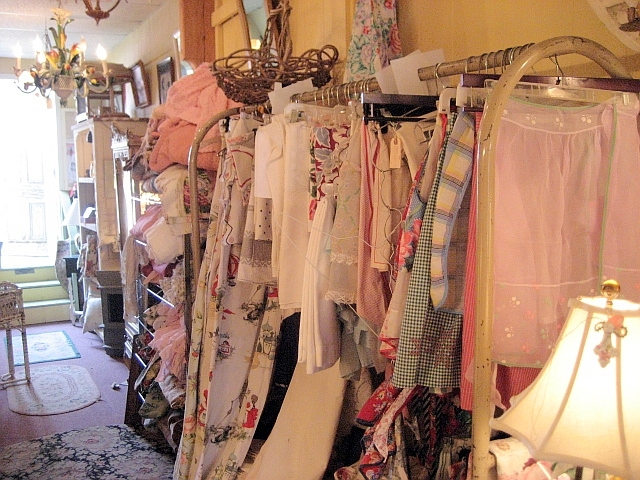 Karen had racks and racks of vintage fabrics, aprons, curtains, etc. I was able to hold my breath and resist, totally. Those of you that follow my blog know that I do NOT need any more fabric for my stash. I have many, many stacks of vintage pieces of fabric. It’s my passion!! I throughly enjoyed visiting Karen’s shop in Hillsborough, NC. Call her at 969.644.0206 if you can drop by sometime. It is SO worth the visit! Oh that shop is FANTASTIC! Your photos really captured its’ sweetness too! Thank you for sharing – I’d love to stop in there one day! I would LOVE to shop at Fetch! This is just my type of place…not too many of them around here. LOVE your photos of FETCH . . . what a fun shop! OOOOO, I’m going there tomorrow! I haven’t been there yet. I meant to comment yesterday to say “hey” – I am in Greensboro. There is a shop in Winston called “Finders Keepers” that you might like. I haven’t been in yet but the owner has been featured in national design mags and has a booth over at the BIG Antique Marketplace on I40. Have fun! Your pix of the shop are wonderful, wish I was in that area so I could check it out. Love these photos. Looks like fun!!! wow! I love shops like that!! I could just move right in and be at home!!! LOVE IT!! Oh my goodness, what a great shop, would love to get into to those fabrics and aprons! Oh! Great pictures. That is my kind of place! Mmmmm, all that fabric…what self-control you have. And congratulations! I saw that Jennifer Paganelli gave you a wonderful mention on her Sisboom blog about your fabulous aprons. Any chance of seeing those cute pin cushions on your Etsy site soon? 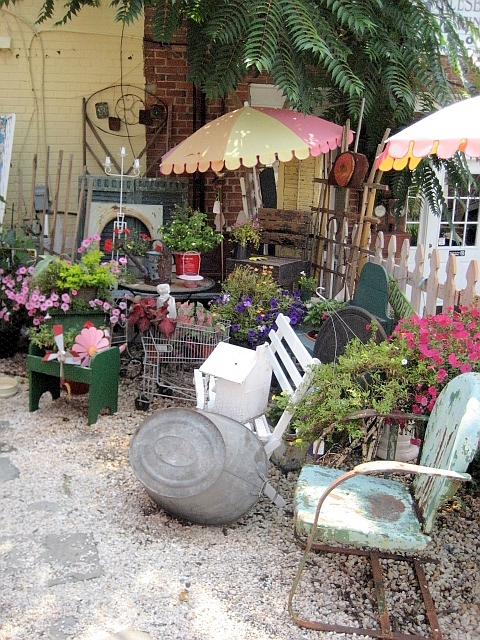 Oh, I just love when bloggers post their visits to shops, makes me feel like I’m browsing, too…it would be so cool to travel the back roads & find treasures. I love that chippy green frame & floral pic. Every shop should have a back garden area…I visit one that has an enclosed one with shabby vintage chairs, birdcages, fountain, etc. & a gravel ground. I love to shop at Fetch`s! 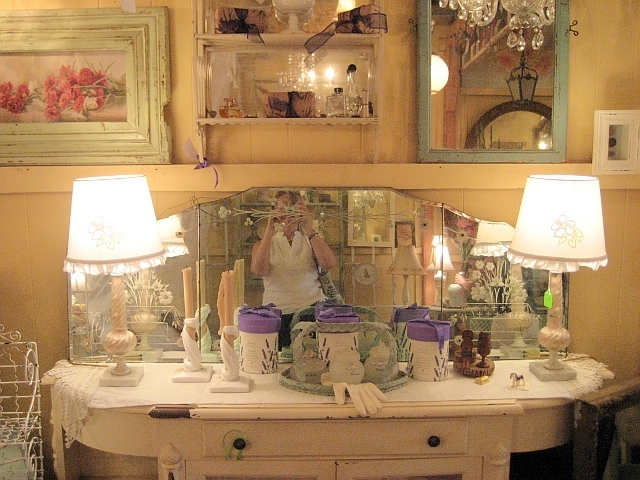 !Karen has a wonderful place,and she is so sweet….. If you ever get a chance to go to Raleigh,you will have to stop at SuzAnna`s antiques.It would be worth your time to go there.And here is their website:suzannasantiques.com.I live not far from Hillsborough,NC,and I am always looking for places to shop.If you know of any good places to go,let me know!! !